Reading and share top 77 famous quotes and sayings about Astronomy by famous authors and people. Browse top 77 famous quotes and sayings about Astronomy by most favorite authors. 1. "Physics says: go to sleep. Of courseyou're tired. Every atom in youhas been dancing the shimmy in silver shoesnonstop from mitosis to now.Quit tapping your feet. They'll danceinside themselves without you. Go to sleep.Geology says: it will be all right. Slow inchby inch America is giving itselfto the ocean. Go to sleep. Let darknesslap at your sides. Give darkness an inch.You aren't alone. All of the continents used to beone body. You aren't alone. Go to sleep.Astronomy says: the sun will rise tomorrow,Zoology says: on rainbow-fish and lithe gazelle,Psychology says: but first it has to be night, soBiology says: the body-clocks are stopped all over townandHistory says: here are the blankets, layer on layer, down and down." 2. "What I aim to do is not so much learn the names of the shreds of creation that flourish in this valley, but to keep myself open to their meanings, which is to try to impress myself at all times with the fullest possible force of their very reality. I want to have things as multiply and intricately as possible present and visible in my mind. Then I might be able to sit on the hill by the burnt books where the starlings fly over, and see not only the starlings, the grass field, the quarried rock, the viney woods, Hollins pond, and the mountains beyond, but also, and simultaneously, feathers' barbs, springtails in the soil, crystal in rock, chloroplasts streaming, rotifers pulsing, and the shape of the air in the pines. And, if I try to keep my eye on quantum physics, if I try to keep up with astronomy and cosmology, and really believe it all, I might ultimately be able to make out the landscape of the universe. Why not?" 3. "Aristotle's opinion... that comets were nothing else than sublunary vapors or airy meteors... prevailed so far amongst the Greeks, that this sublimest part of astronomy lay altogether neglected; since none could think it worthwhile to observe, and to give an account of the wandering and uncertain paths of vapours floating in the Ether." 4. "Dr. Watson's summary list of Sherlock Holmes's strengths and weaknesses:"1. Knowledge of Literature: Nil.2. Knowledge of Philosophy: Nil.3. Knowledge of Astronomy: Nil.4. Knowledge of Politics: Feeble.5. Knowledge of Botany: Variable. Well up in belladonna, opium, and poisons generally. Knows nothing of practical gardening.6. Knowledge of Geology: Practical but limited. Tells at a glance different soils from each other. After walks has shown me splashes upon his trousers, and told me by their colour and consistence in what part of London he had received them.7. Knowledge of Chemistry: Profound.8. Knowledge of Anatomy: Accurate but unsystematic.9. Knowledge of Sensational Literature: Immense. He appears to know every detail of every horror perpetrated in the century.10. Plays the violin well.11. Is an expert singlestick player, boxer, and swordsman.12. Has a good practical knowledge of British law." 5. "[In high school] my interests outside my academic work were debating, tennis, and to a lesser extent, acting. I became intensely interested in astronomy and devoured the popular works of astronomers such as Sir Arthur Eddington and Sir James Jeans, from which I learnt that a knowledge of mathematics and physics was essential to the pursuit of astronomy. This increased my fondness for those subjects." 6. "Astronomy is, not without reason, regarded, by mankind, as the sublimest of the natural sciences. Its objects so frequently visible, and therefore familiar, being always remote and inaccessible, do not lose their dignity." 7. "It is to these two discoveries by Bradley that we owe the exactness of modern astronomy. .... This double service assures to their discoverer the most distinguished place (after Hipparchus and Kepler) above the greatest astronomers of all ages and all countries." 8. "Astronomy's much more fun when you're not an astronomer." 9. "I think music is about our internal life. It's part of the way people touch each other. That's very precious to me. And astronomy is, in a sense, the very opposite thing. Instead of looking inwards, you are looking out, to things beyond our grasp." 10. "If an Elder shall give us a lecture upon astronomy, chemistry, or geology, our religion embraces it all. It matters not what the subject be, if it tends to improve the mind, exalt the feelings, and enlarge the capacity. The truth that is in all the arts and sciences forms part of our religion. Faith is no more a part of it than any other true principle of philosophy." 11. "Foreign stars in the nights down there. A whole new astronomy Mensa, Musca, the Chameleon. Austral constellations nigh unknown to northern folk. Wrinkling, fading, through the cold black waters. As he rocks in his rusty pannier to the sea's floor in a drifting stain of guano. What family has no mariner in its tree? No fool, no felon. No fisherman." 12. "What are your interests? ""Your son in my room," I said. "Excuse me? ""The sun and the moon," I said. "Astronomy." 13. "Paris was a place where one wanted to walk, where to walk—flâner, as the French said—was practically a way of life. ("Ah! To wander over Paris!" wrote Honoré de Balzac. "What an adorable and delectable existence is that! Flânerie is a form of science, it is the gastronomy of the eye." 14. "A man may possess a profound knowledge of history and mathematics; he may be an authority in psychology, biology, or astronomy; he may know all the discovered truths pertaining to geology and natural science; but if he has not with this knowledge that nobility of soul which prompts him to deal justly with his fellow men, to practice virtue and holiness in his personal life, he is not truly an educated man.Character is the aim of true education; and science, history, and literature are but means used to accomplish the desired end. Character is not the result of chance work but of continuous right thinking and right acting." 15. "In astrology the rules happen to be about stars and planets, but they could be about ducks and drakes for all the difference it would make. It's just a way of thinking about a problem which lets the shape of that problem begin to emerge. The more rules, the tinier the rules, the more arbitrary they are, the better. It's like throwing a handful of fine graphite dust on a piece of paper to see where the hidden indentations are. It lets you see the words that were written on the piece of paper above it that's now been taken away and hidden. The graphite's not important. It's just the means of revealing the indentations. So you see, astrology's nothing to do with astronomy. It's just to do with people thinking about people." 16. "Computer science is no more about computers than astronomy is about telescopes." 17. "I love biomedical science, I love astronomy, and you can't really do much with those in a fantasy setting." 18. "Similarly, many a young man, hearing for the first time of the refraction of stellar light, has thought that doubt was cast on the whole of astronomy, whereas nothing is required but an easily effected and unimportant correction to put everything right again." 19. "After a duration of a thousand years, the power of astrology broke down when, with Copernicus, Kepler, and Galileo, the progress of astronomy overthrew the false hypothesis upon which the entire structure rested, namely the geocentric system of the universe. The fact that the earth revolves in space intervened to upset the complicated play of planetary influences, and the silent stars, related to the unfathomable depths of the sky, no longer made their prophetic voices audible to mankind. Celestial mechanics and spectrum analysis finally robbed them of their mysterious prestige." 20. "I turned my attention for a while to gamma ray astronomy and soon began the first in a continous series of experiments at the Savannah River site to study the properties of the neutrino." 21. "I remember that he was always trying to expound to me in his broken Russian some special system of astronomy he had invented. I was told that he had once published it, but the learned world had only laughed at him. I think his wits were a little deranged." 22. "(Popular singer Eddie Fisher, appearing on This is Show Business, told Kaufman that women refused to date him because he looked so young.) Mr. Fisher, on Mount Wilson there is a telescope that can magnify the most distant stars up to twenty-four times the magnification of any previous telescope. This remarkable instrument was unsurpassed in the world of astronomy until the construction of the Mount Palomar telescope, an even more remarkable instrument of magnification. Owing to advances and improvements in optical technology, it is capable of magnifying the stars to four times the magnification and resolution of the Mount Wilson telescope - Mr Fisher, if you could somehow put the Mount Wilson telescope inside the Mount Palomar telescope, you still wouldn't be able to detect my interest in your problem." 23. "My days I devote to reading and experiments in chemistry, and I spend many of the clear nights in the study of astronomy. There is, though I do not know how there is or why there is, a sense of infinite peace and protection in the glittering hosts of heaven. There it must be, I think, in the vast and eternal laws of matter, and not in the daily cares and sins and troubles of men, that whatever is more than animal within us must find its solace and its hope." 24. "Most people today still believe, perhaps unconsciously, in the heliocentric universe every newspaper in the land has a section on astrology, yet few have anything at all on astronomy." 25. "Radio astronomy reflects our fascination with how audio can be used to understand information or ideas. 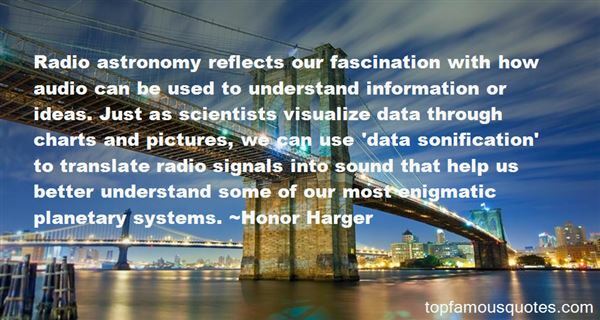 Just as scientists visualize data through charts and pictures, we can use 'data sonification' to translate radio signals into sound that help us better understand some of our most enigmatic planetary systems." 26. 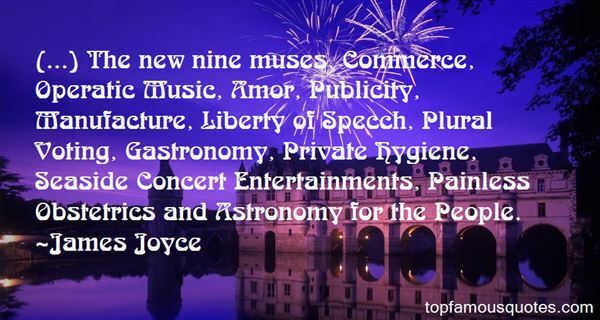 "(...) The new nine muses, Commerce, Operatic Music, Amor, Publicity, Manufacture, Liberty of Specch, Plural Voting, Gastronomy, Private Hygiene, Seaside Concert Entertainments, Painless Obstetrics and Astronomy for the People." 27. "A physicist that I know commented that many other scientific disciplines, such as geology, anthropology, astronomy, are also challenged by biblical fundamentalism, but their people seem to be able to get on with their work without worrying unduly. Only Darwinians seem thrown into a frenzy that sends them running to litigation and demanding censorship. His explanation was that it's a rival religion." 28. "For, to my mind, this is a certain principle, that nothing is here treated of but the visible form of the world. He who would learn astronomy, and other recondite arts, let him go elsewhere. (on commenting the text of Genesis 1:6)"
29. "There are only certain intervals of time when life of any sort is possible in an expanding universe and we can practise astronomy only during that habitable time interval in cosmic history." 30. "Dictionaries, manuals, grammars, study guides and topic notes, classical authors and the entire book trade in de Viris, Quintus-Curtius, Sallust, and Livy peacefully crumbled to dust on the shelves of the old Hachette publishing house; but introductions to mathematics, textbooks on civil engineering, mechanics, physics, chemistry, astronomy, courses in commerce, finance, industrial arts- whatever concerned the market tendencies of the day - sold by the millions of copies." 31. "In the 1960s, you could eat anything you wanted, and of course, people were smoking cigarettes and all kinds of things, and there was no talk about fat and anything like that, and butter and cream were rife. Those were lovely days for gastronomy, I must say." 32. "Harris loved to read and he shared everything he read. He read to whoever happened to be in the room from whatever paper he happened to be making his way through. Ann Landers and the horoscope, of course, headlines, cartoons, Miss Manners, Heloise, the lives of others, in many forms, long articles on astronomy or anthropology, political pieces, op-ed pieces, book reviews, church bazaars, executions, plane crashes, disco artists, whatever caught his interest." 33. "You will certainly not doubt the necessity of studying astronomy and physics, if you are desirous of comprehending the relation between the world and Providence as it is in reality, and not according to imagination." 34. "I signed up for astronomy in collegeJust to be close to a girlI lost before the course was over. She'd seen meWalking below some cherry trees on campus.‘The world was blooming,' she wrote.‘And you trudged through, looking at the ground." 35. "The so-called Christian nations are the most enlightened and progressive ... but in spite of their religion, not because of it. The Church has opposed every innovation and discovery from the day of Galileo down to our own time, when the use of anesthetic in childbirth was regarded as a sin because it avoided the biblical curse pronounced against Eve. And every step in astronomy and geology ever taken has been opposed by bigotry and superstition. The Greeks surpassed us in artistic culture and in architecture five hundred years before Christian religion was born." 36. "In 1959 the University recognized our work by appointing me to a new Chair of Radio Astronomy." 37. "I went to the University of Washington as a physics and astronomy major. My other interest, of course, was aviation. I always wanted to be a pilot. And if you're going to fly airplanes, the best place to be is the Air Force." 38. "The author explains the evidence for they would help from astronomy. He says that if planets are behaving in a way that cannot be explained by what is already known, then another planet is searched for which would explain their behavior. This, he says, is actually how the more distant planets were discovered. We look, then, for something that would explain what is not inexplicable from what we already see." 39. 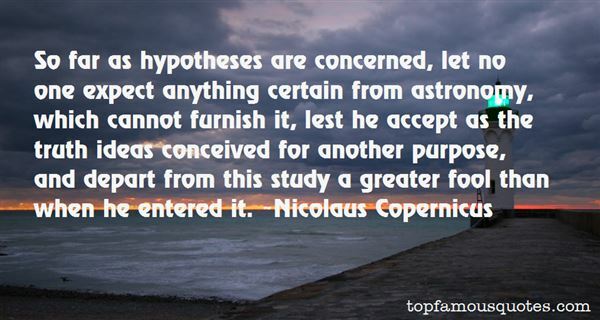 "So far as hypotheses are concerned, let no one expect anything certain from astronomy, which cannot furnish it, lest he accept as the truth ideas conceived for another purpose, and depart from this study a greater fool than when he entered it." 40. "At night the sky is pure astronomy." 41. "I almost got a psychology degree, I almost got a philosophy degree. I kept changing it so they couldn't make me graduate. I studied anthropology and eastern religion, epistomology, and astronomy... I took every interesting course I could find for nine years." 42. "The sciences are not sectarian. People do not persecute each other on account of disagreements in mathematics. Families are not divided about botany, and astronomy does not even tend to make a man hate his father and mother. It is what people do not know, that they persecute each other about. Science will bring, not a sword, but peace." 44. "We are probably nearing the limit of all we can know about astronomy." 45. "I only watch National Geographic Channel, and also I have the app on my phone. I'm into astronomy and love to learn about new facts." 46. "Astronomy defined our home as a small planet tucked away in one corner of an average galaxy among million; biology took away our status as paragons created in the image of God; geology gave us the immensity of time and taught us how little of it our own species has occupied." 47. "Does the evolutionary doctrine clash with religious faith? It does not. It is a blunder to mistake the Holy Scriptures for elementary textbooks of astronomy, geology, biology, and anthropology. Only if symbols are construed to mean what they are not intended to mean can there arise imaginary, insoluble conflicts. As pointed out above, the blunder leads to blasphemy: the Creator is accused of systematic deceitfulness." 48. "At one time, the state of culture in Czechoslovakia was described, rather poignantly, as a 'Biafra of the spirit'. . . I simply do not believe that we have all lain down and died. I see far more than graves and tombstones around me. I see evidence of this in . . . expensive books on astronomy printed in a hundred thousand copies (they would hardly find that many readers in the USA) . . ."
49. "I love travelling and going on wildlife safaris. I have an interest in astronomy. I like reading on current affairs, business and science. I love doing nothing if I can help it." 50. "As a rule, theologians know nothing of this world, and far less of the next; but they have the power of stating the most absurd propositions with faces solemn as stupidity touched by fear.It is a part of their business to malign and vilify the Voltaires, Humes, Paines, Humboldts, Tyndalls, Haeckels, Darwins, Spencers, and Drapers, and to bow with uncovered heads before the murderers, adulterers, and persecutors of the world. They are, for the most part, engaged in poisoning the minds of the young, prejudicing children against science, teaching the astronomy and geology of the bible, and inducing all to desert the sublime standard of reason." We depend on our surroundings obliquely to embody the moods and ideas we respect and then to remind us of them. We look to our buildings to hold us, like a kind of psychological mould, to a helpful vision of ourselves. We arrange around us material forms which communicate to us what we need — but are at constant risk of forgetting what we need — within. We turn to wallpaper, benches, paintings and streets to staunch the disappearance of our true selves."